Welcome to the University of Nebraska Kearney's Parking Division. To view or appeal a parking ticket or to view your parking account, please click the following link to UNK's Parking. To pay a parking ticket go to your MyBLUE account. Visitors are welcome on campus. Visitor permits may be obtained at the UNK Police Department located in the Facilities Building, between Highway #30 and University Drive on 19th Avenue. Visitor permits allow for parking in all parking stalls (to include parking meters). Visitor permits are not valid in yellow zones, fire lanes, handicap stalls, stalls marked Reserved, loading zones, etc. Schools visiting campus may drop off and pick up their students near the area where the event is occurring. Schools that bring buses or any vehicle that takes up more than a single parking stall, must park those buses in Lot 29, south of the Health Sports Center. If utilizing school vans and it is marked as being part of your school, you do not need a parking permit and may park in any non-reserved stall. To find out more about the University of Nebraska at Kearney's parking policies, please follow the links below to the Policies and Procedures document. For students living on campus stop by UNK Police at the Facilities Building to purchase your permit. For students requiring commuter or perimeter permits, please complete the Student Vehicle Registration form above. Most of the required information can be found on your State Vehicle Registration (pink slip for Nebraskans). Visit UNK Police located in the Facilities Building, with completed form and payment to pick up your permit. You may purchase your parking through your "MyBlue" account or you may mail the Faculty/Staff Registration form to UNK Police - Parking Division and we will send your permit via campus mail. You can also visit us at UNK Police in the Facilities Building with the completed paperwork (this will save time waiting in line). Most of the required information can be found on your State Vehicle Registration (pink slip for Nebraskans). You will still need to fill out the vehicle registration form even if Parking Division has your current information. Open the Faculty/Staff Vehicle Registration form above to print the form. Decide if you would like to use payroll deduction or send a check. Print, complete and sign the form. If you are using payroll deduction please fill out both sections of the form. If you are paying with check then you will need to fill out the top vehicle registration information only. Mail completed form and check (if not using payroll deduction) to UNK Police - Parking Division. In order to obtain your Permit your employment will be verified through Human Resources and all tickets must be paid. We will return your permit via campus mail within one week or less. 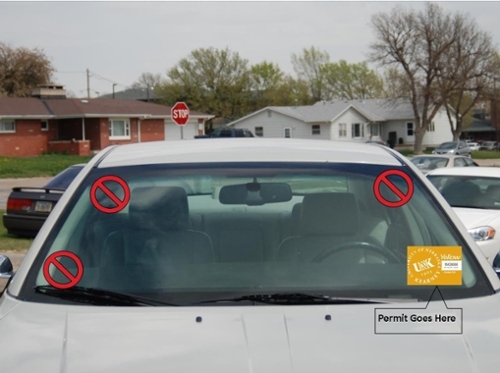 For a list of Parking Regulations, see the Policies tab or obtain regulations from UNK Police or the Finance Office. Students with disabilities, please follow the link to UNK's Disability Services Administration's campus map. For a general map of UNK's campus, click this link for a campus map. Click this link for walking maps of UNK categorized by length in miles.